Get in line for a ride on a legendary steel coaster that roars. Named after the king of the jungle, Kumba remains one of Busch Gardens best rides. You will be taken on a thrill ride starting with a 135 foot drop. You will then plunge into a diving loop and feel a full 3 seconds of total weightlessness while rotating 360 degrees! Kumba has been consistenly recognised as one of the best roller coasters in the world for many years in a row! Hear the roar of a lion for yourself on this mighty roller coaster. Known as the thrilling triple-launch roller coaster, Cheetah Hunt will make you feel like the fastest land animal in the world. 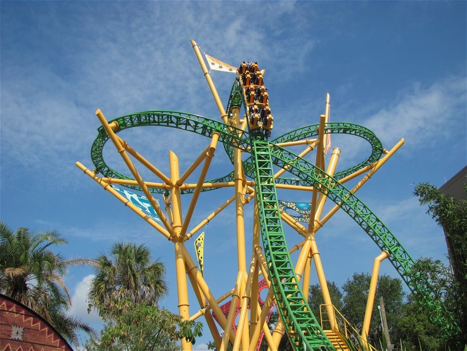 Busch Gardens Tampa’s longest roller coaster quickly raced itself on the list of best rides. You will be carried high above the park, then raced down at high speeds along the park grounds through a rocky gorge. After you travel through the 4,400 ft long track, you’re going to want to get right back in line to ride on this high thrill coaster again! If you like intense thrills, then this rides for you. Montu is a classic and favorite at Busch Gardens for its speed and inversions. You will climb up high into the thin air where you will want to hold on tight for a twisting drop, a 60-foot vertical loop, an immelmann loop (a simultaneous loop and roll), and a weightless roll. And that's only the beginning. Montu has a total of 7 inversions and was the first roller coaster in the world to incorporate an immelmann loop. You will for sure become a coaster enthusiast after this ride! Ready to experience a 90 degree drop? This ride will get your heart pumping fast when your hanging over the edge of a 90-degree drop 200 feet in the air. Sheikra will inches you mercilessly over the edge and then will suddenly stop. Hold your breath as you surrender to speed as you fly straight down into a 70 mile per hour coaster. But wait, there’s more. Sheikra will also take you through an immelmann loop, another dive into an underground tunnel, and a splashdown finale that drenches everyone watching you catch your breath. With only three coaster s of its kind remains in the world, Scorpion is a must! You will feel the thrill of the ride as you travel through a 360 degree vertical loop and many twists and turns. Scorpion reaches speeds up to 50 miles per hour and leaves you full of energy and excitement! If you have been to Busch Gardens Williamsburg and thought Mach Tower was tall, then just wait. It’s one thing to drop from 240 feet in the air in Williamsburg, but it’s a whole other feeling when you drop 335 feet from this freestanding drop tower. Not only does it just drop you, but your seat pivots you to a 90 degree angle before your free falling face-first at 60 miles per hour. Falcon’s Fury offers you an incredible view of Busch Gardens while encompassing the view of downtown Tampa. You’ll have just enough time to enjoy the view until your starts pounding away. Falcon’s Fury will give you a glimpse of the thrill of skydiving. During your visit at Busch Gardens,, make sure to check out the construction of the newest coaster, Tigirs. Busch Gardens is bring a whole new level of excitement with Florida’s tallest coaster ever. Once you see its height, you’ll be planning your trip back to the park during the spring season. Tigris will catapult you through an exciting lineup of looping twists with forward and backward motion, breath-taking drops, a 150-foot skyward surge, and an inverted heartline roll, all at more than 60 miles per hour. Now that’s a roller coaster. The 1,800 feet of steel track is designed and built to mimic the power and agility of a tiger. Busch Gardens has some awesome seasonal events coming up this Fall and Winter. 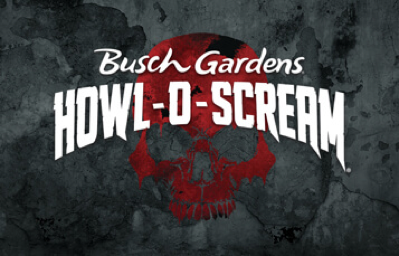 Staring September 15th, Busch Gardens has its annual event, Howl-O-Scream. Filled with fun and fright, Busch Gardens turns into a haunted park and leaves you wanting to go back. This year they are celebrating 20 years of fear and scares and are adding an all-new era of terror, never seen before. Your visit will be a collection of haunted houses, immersive themed scare zones, challenging escape rooms and darkly entertaining live shows. Starting October 6th, celebrate Halloween with Elmo, Abby, Grover and all your favorite Sesame Street friends every Saturday and Sunday during Sesame Street Safari of Fun Kids’ Weekends. Put on your best costumes during your visit and make sure to check out Busch Gardens website as each weekend has a theme. Trick-or-treat, enjoy exclusive crafts, explore through a hay bale maze and play fall and halloween inspired activities. Don’t forget to check out the dance party with all the Sesame Street characters. Both of these events end on October 28th so make sure to plan your visit before they end. Find additional event information online and check out the Howl-O-Scare factor for families and groups traveling with young children. Busch Gardens offers one day and multi-day tickets. Tickets are usually $105 for one day, $150 for 2 day, and $170 for 3 day. Right now, if you buy your tickets online you can save up to $25 for 1 day and $50 for multi-day tickets. Check out Busch Gardens Tampa website for additional ticket specials throughout the season. There are also special offers for Youth Group Tickets - contact swobgtgroupsales@seaworld.com or call the group sales above. BUSH gARDENS pARK mAP. ALL CREDITS bUSH gARDENS. If you are traveling with a big group, a great option would be to rent out a charter bus or school bus to take your group back and forth from the park. The great part about chartering a bus is you get picked up and dropped off right at your doorstep. BookBuses.com provides accurate and affordable quotes according to your needs during your trip, such as custom stopovers, restrooms, WiFi, power outlets, and much more. Instead of having to do intensive research on different kinds of charter buses you can get, head to the BookBuses.com saves you so much time researching different bus charter options as the website platform allows you see and compare all the different charter bus companies so you can get the best price! To make things even easier for you, BookBuses takes care of all the details. All you have to do is book a bus and wait for the day it arrives! Visit bookbuses.com or call (646) 801 6280 for more information and bus possibilities for your group travels! Need help to get to Busch Gardens from Orlando or St. Petersburg?